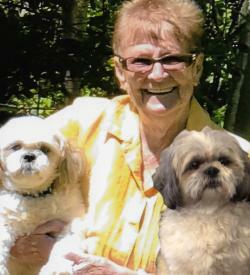 The death occurred suddenly at the home of her daughter and son-in-law, on Sunday, January 27, 2019, of Shirley Mary Doucette, age 72 years. Born at Nail Pond, PEI on January 23, 1947, she was the daughter of the late Fidele and Florence (nee Doucette) Perry. Lovingly remembered by her children, Juanita (Norman) Hustler of Union Road, Jackie (Kevin) Blanchard of Greenmount and Nicky (Alicia) Doucette of Nail Pond. Cherished grandmother to Latesha Gallant (Josh McIsaac) of Hebron, Martina Gallant of Greenmount, Ceanna Blanchard of Greenmount, Rogan Hustler of Union, Jenica Hustler of Union, Bensen Silliker of Nail Pond and Owen Silliker of Nail Pond. Great grandmother to, Rylynn and Alysynn. Dear sister to Ivan (Angela) Perry of Nail Pond, Phyllis (Austie) Arsenault of Nail Pond, Etta (Russell) Bernard of Nail Pond and Cora (Late Lester) Gallant of Nail Pond. She will be sadly missed by her nieces, nephews and friends, especially her fur babies Maggie and Sega whom she loved dearly. Resting at the Rooney Funeral Home and Chapel, Alberton. Visiting hours Wednesday 6:00 to 9:00 p.m. Funeral Thursday morning from St. Simon and St. Jude Church, Tignish, for funeral mass at 10:30 a.m. Interment later in the church cemetery. As an expression of sympathy, memorials to the PEI Humane Society would be gratefully appreciated.